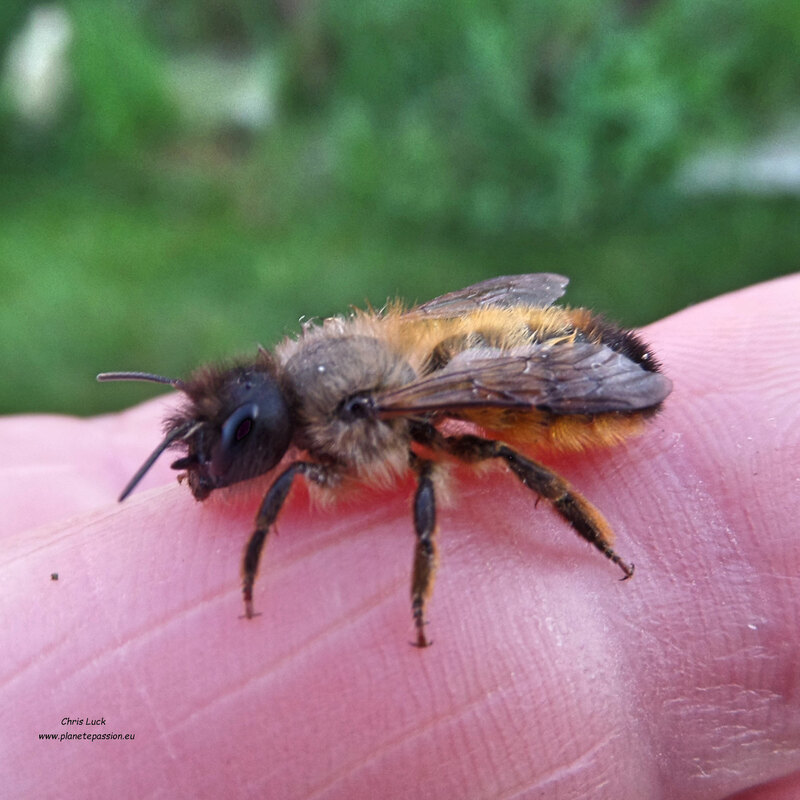 Perhaps more so in the UK than anywhere else solitary bees have been given common or everyday group names according to their nesting characteristics and many people will already be aware of this. Although these common group names are descriptive and not scientific, many will have originated in the 19th or even earlier. Terms such as “Carpenter bees”, “Mason bees”, “Mining bees”, “Leaf cutter bees”, and “Wool Carder bees” are the ones we most commonly come across and they can be very useful for ordinary people like me in providing a basic understanding of what is a highly complex subject. 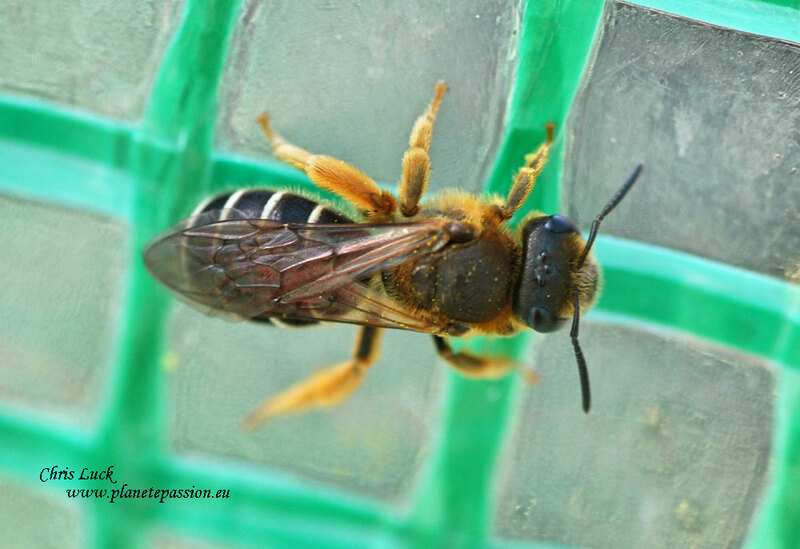 If nothing else it can provide some indication as to what different solitary bees require enabling us to find ways to provide the habitat and nesting structures that are necessary for them. As is the case for so many other species these required habitats have been greatly reduced largely due to changes in agriculture and to a lesser extent the manner in which we have altered the way we use both buildings and gardens. Pesticides as a whole and chemical pollution are inevitably having a detrimental effect. There are 15 species of Carpenter bee in all and you can read more HERE. There is however at least one other species of bee that makes its nest by burrowing into rotten wood and that is Anthophora furcata or the Forked tail flower bee as it is sometimes known. Other Anthophora species nest in the ground, cliff faces or holes in the mortar joints of stone walls and are often called “Flower bees”, the best known of which is perhaps the Hairy footed flower bee Anthophora plumipes. Mason Bee is a term commonly used for species of bees in the genus Osmia although some bees from other genera can also be called Mason bees. These fascinating and important bees will nest in almost any cavity which they will if necessary modify with earth or other materials to suit their requirements. This could be an existing hole in wood, a fissure in a wall or tree, hollow stems or canes and some species even use empty snail shells. In the case of empty snail shells, once the nest is provisioned with eggs and nutrition it is sealed with grit and soil before being carefully covered by the female with pieces of grass presumably to protect it. She will sometimes position the shell by moving it around a little. Osmia aurulenta, Osmia bicolour and Osmia spinulosa are three species that typically use empty snail shells. Pollen is collected on a pollen brush of hairs beneath the females’ abdomen. 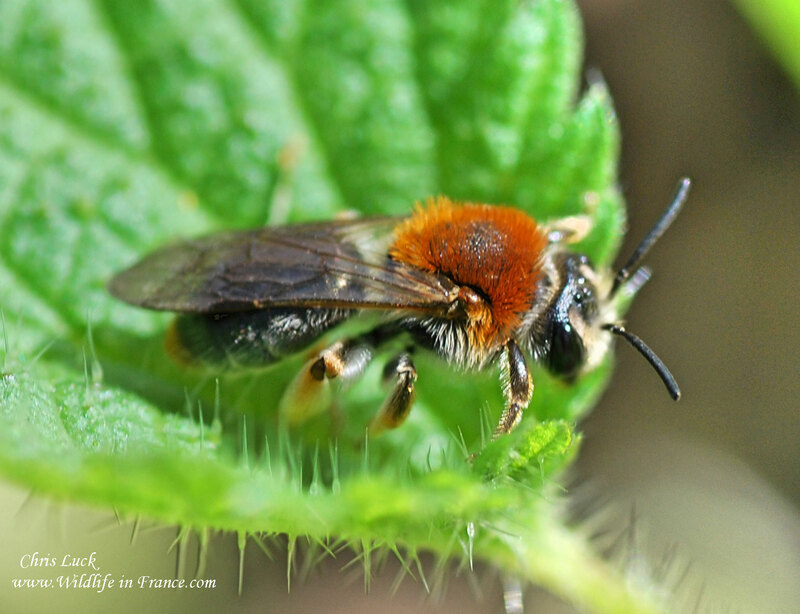 There are 47 species of Osmia to be found in France although many are rare or regionally localised. 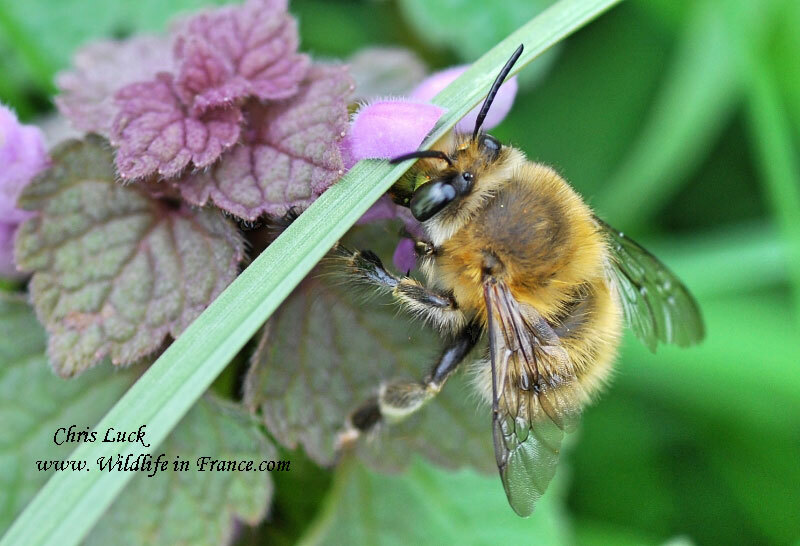 Most of the bees referred to as Mining bees belong to the genus Andrena and there are some 177 species of these known in France. Sizes vary considerably between species from 6mm to 17mm. Andrena females can be readily distinguished from most other small bees by the possession of broad velvety areas in between the compound eyes and the antennal bases, called "facial foveae" along with large pollen-collecting hairs (scopae) on the upper part of their hind legs right up to their abdomen. Nests, which are often dug to a great depth thus avoiding the consequences of severe freezing weather, can be isolated or in aggregations and are situated in bare or nearly bare soil with an open or moderately open aspect. They have a single entrance tunnel with several side or subsidiary cells or each of which will house a single egg that is placed on a smooth round ball of pollen. The cells themselves are lined with a wax like substance that provides protection against wet. Most Andrena species have a single generation a year, although there are some that have two generations a year when seasonal dimorphism may be shown, (the condition of having two distinct varieties which appear at different seasons). Spring species over-winter as adults in their natal cells, whereas summer species over-winter as diapausing prepupae, (in their cell). The two sexes emerge more or less at the same time, the males a few days earlier than the females. Most species are polylectic, (collecting pollen from a wide range of plants), but there are some species that are oligolectic, (using or having a preference for only one type of plant), for pollen sources. The Ashy mining bee, Andrena agilissima, is one such common example that only takes pollen from some Cruciferous plants, (mustards, rapes, charlocks etc), and the Bryony mining bee, Andrena florae, that only takes pollen from White Bryony. Colletes is another smaller group of ground-nesting bees of the family Colletidae. They tend to have isolated nests but sometimes nest close together in aggregations. Species in the genus build cells in underground nests that are lined with a cellophane-like plastic secretion which is a type of polyester earning them the nickname Polyester bees or Plasterer bees. The majority are later season species from May onwards with very few in Spring with a very late season species in the Ivy bee, Colletes hederae, which is a very pretty bee that uses the flowers of Ivy for pollen and nectar. Some 26 species of Colletes in France. Hylaeus species are small, shiny, hairless bees between 5 and 7mm in length. 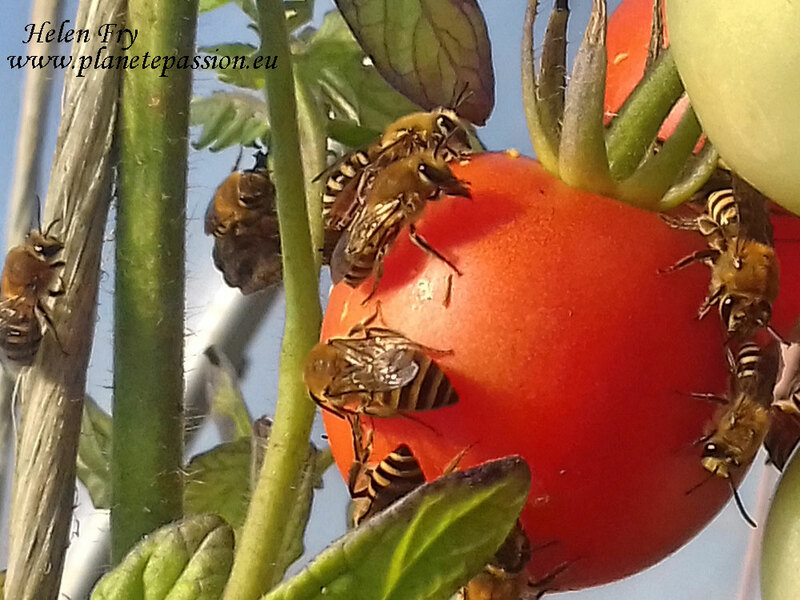 As they have no external means of carrying pollen they transport it to their nest using their crops mixed with nectar. Nests, which are also lined with a cellophane or plastic like substance, are made in hollow stems and twigs or holes made in wood by other insects. These species often have white or yellow facial markings and as a result some people call them “Masked bees”. There are some 53 species in France. Leaf cutter bees come from the Megachile genus and like the Mason bees they use all manner of existing cavities or fissures. Nests are made using discs that they cut from leaves which they glue together with saliva to construct a tube. The leaves used vary from species to species; some appear to only use one or two species of tree, others are less fussy. A good example of a common species is Megachile centuncularis that uses 6-14 circular leaf pieces per cell body with 6-7 discs to make the lid for each cell. Several cells will be created in each tube each with its own provisioned egg and this bee uses ash, birch, honeysuckle, horse-chestnut, lilac, rose leaves and other deciduous trees hence its common name the Patchwork leaf-cutter. Pollen is collected on the underside of their abdomen which is often raised or tilted upwards when they are feeding. 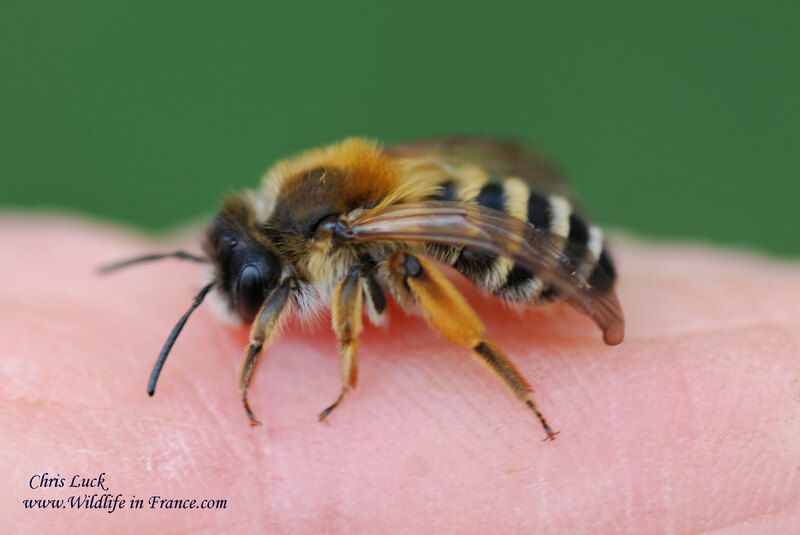 There are some 40 species of “leafcutter bee” in France. Wool Carder bees or "Abeille cotonnière" as they are called in French are from the genus Anthidium. 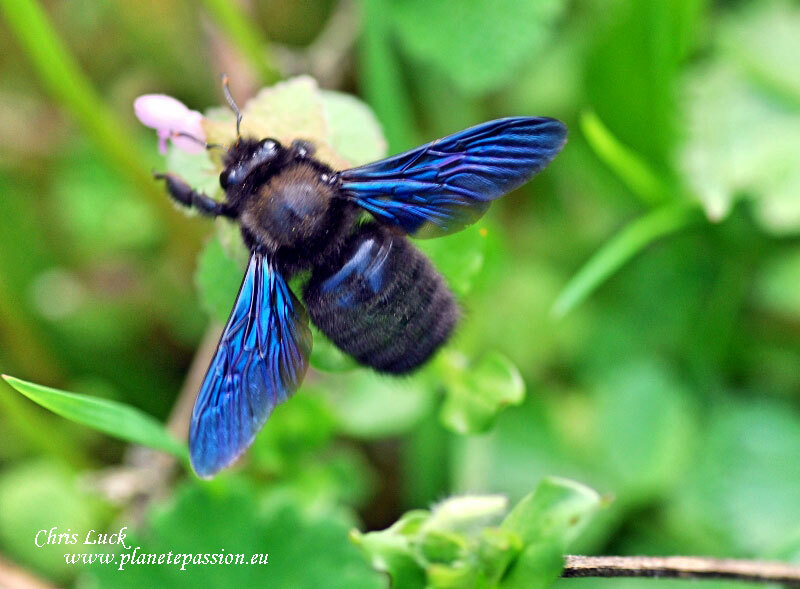 The violet carpenter bees, Xylocopa violacea and Xylocopa valga are both types of so called solitary bees found in southern and central Europe. 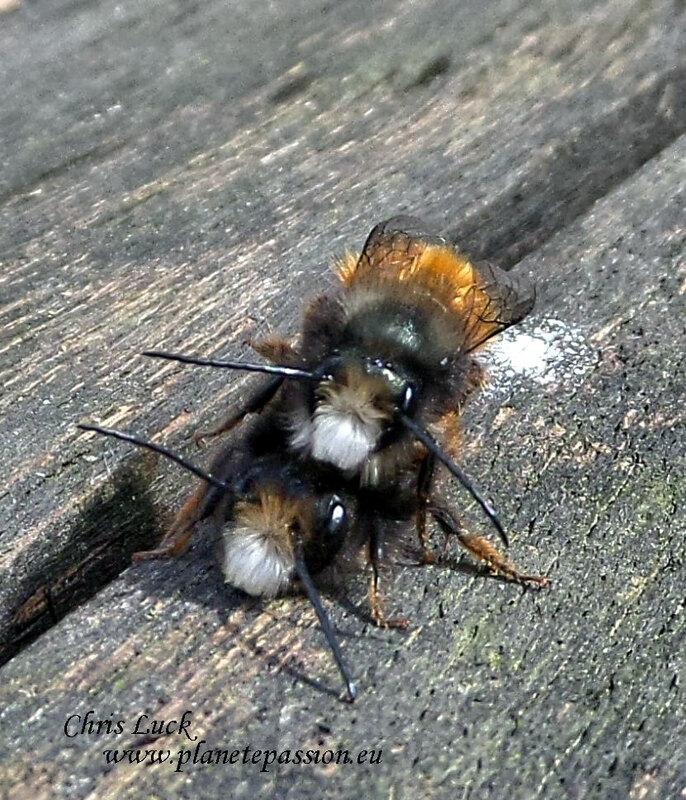 Two male Osmia cornuta that seem a little mixed up. Males have a very distinctive hairy white face. The banded or white bellied mining bee, (Andrena-gravida), nests are constructed in the ground often in a variety of south facing open areas and in sandy soils such as banks, parkland, chalk grassland and ploughed field margins. The Early or Orange tailed Mining bee, Andrena haemorrhoa, has females that are very distinctive, with a bright, foxy-coloured covering of hairs on the thorax and a similarly-coloured tuft of hairs at the tip of the abdomen which is otherwise almost completely hairless and shining black. Colletes hederae or Ivy bees in a poly-tunnel. Bees and other insects are attracted to such places where they can become trapped and may need helping out again. The Orange legged furrow bee, (Halictus rubicundus). Individual nests support a small eusocial population, founded by a mated queen in the spring. This queen rears a small number of workers and then the colony produces new males and females at the end of the summer.